belies its warmth and serenity once inside. While considered to be one of the largest and most majestic villas on Anguilla with plenty of room to spread out and unwind, Ultimacy offers many secluded spots for quiet conversation, reflection and peaceful meditation to the pulse of the calming surf against the rocks. 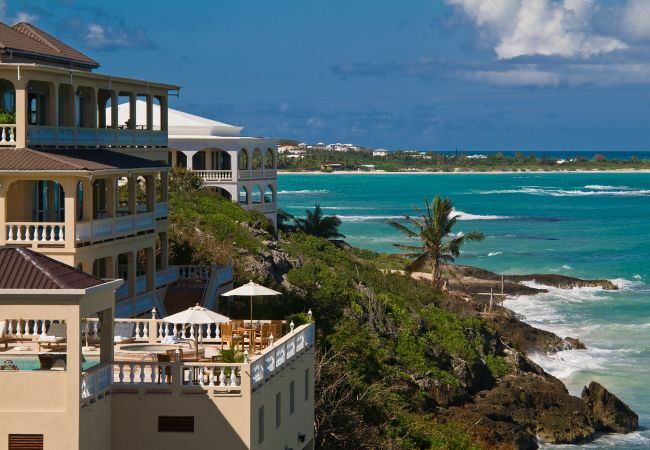 The gated entrance and lush gardens welcome you to paradise. 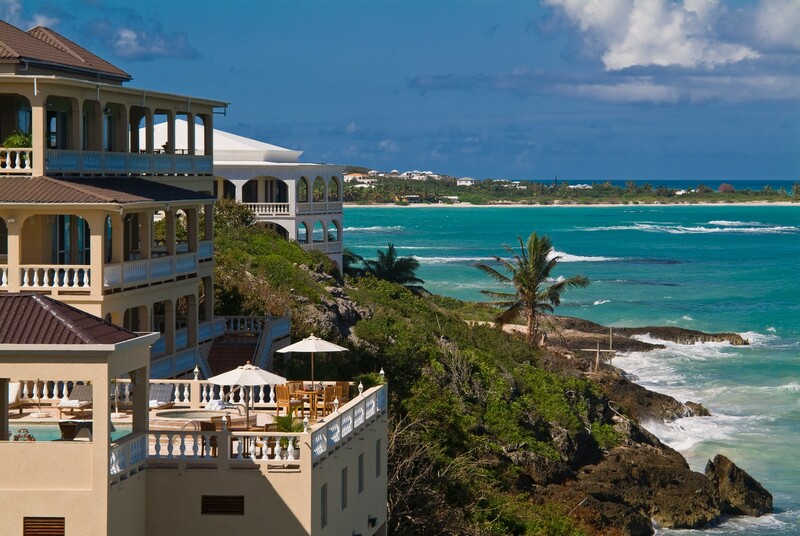 A carriage drive and tiled walkways lead to the protected national marine park at the property’s edge. Ultimacy Villa is tastefully decorated in tropical hues, and provides 20,000 square feet of spectacular indoor and outdoor living space for you and your guests to enjoy. 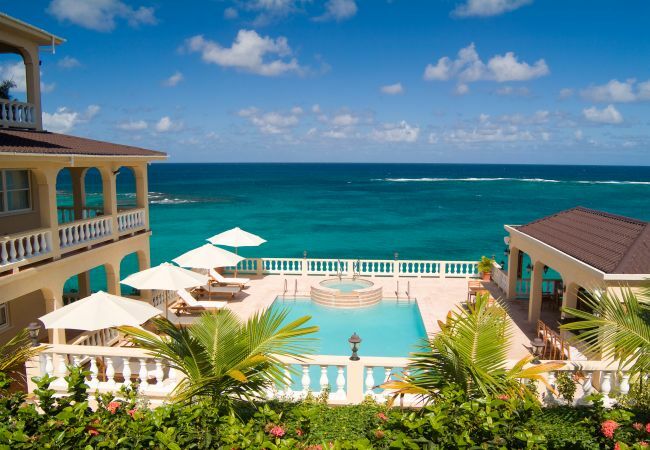 The villa spans 8 bedrooms, 10 bathrooms, 3 living rooms, 3 kitchens, a large recreation room, a fitness room, one formal dining room and 3 al fresco dining alcoves, 3 outdoor lounge areas and a magnificent pool pavilion. The essence of this seaside retreat is the feeling of unparalleled relaxation and tranquility whilst providing first class amenities. 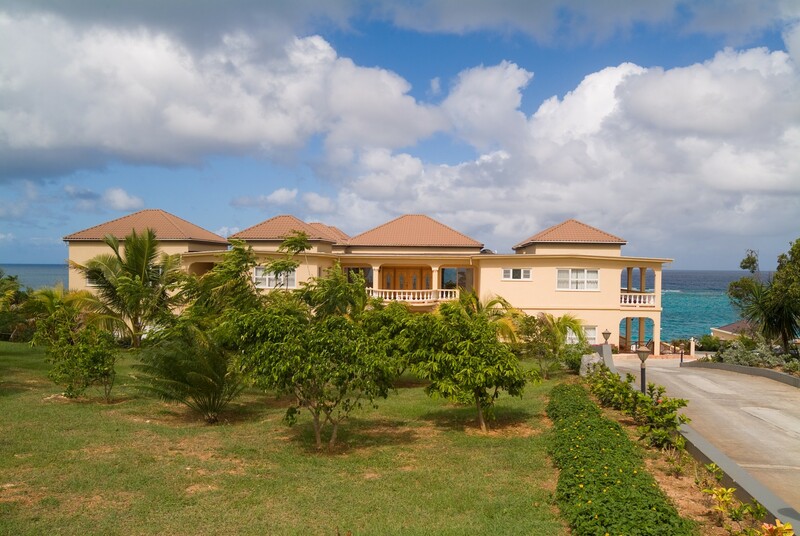 Each floor of this three storey manor promises a unique living and entertaining experience. Dual staircases curve up to the top floor, where the main living room and spectacular views of the turquoise waters unfold as you enter the villa. 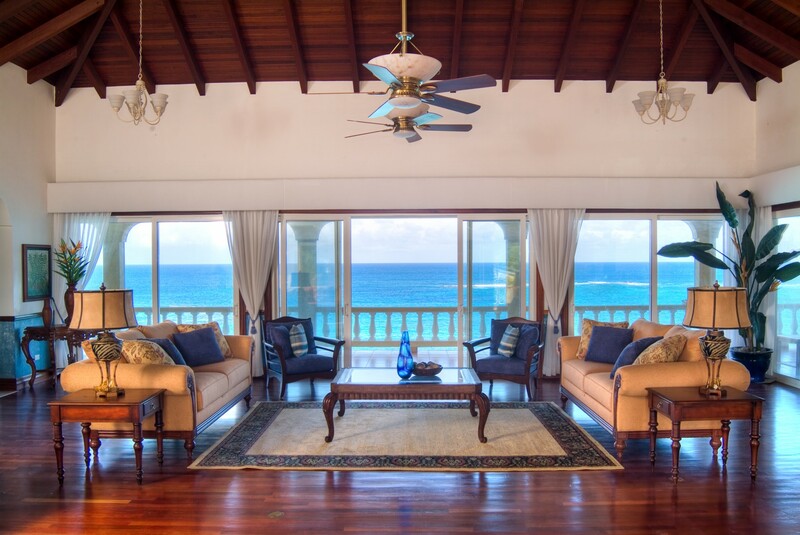 The main living room of Ultimacy Villa is the focal point of the top floor with cathedral ceilings that invite the island’s cooling easterly breezes. The main living room offers a gracious and inviting ambiance for both entertaining and repose. An array of plush furnishings allows for lively conversation or a choice of comfy spots to curl up with a good book. Two generous master suites are located off of the main living room. Both are air-conditioned and feature king-size, four-poster beds and traditional tropical ceiling fans. Private baths, dressing areas and walk-in closets complete the layout in both suites. The main kitchen is located on the western end of the top floor and was designed for both the master and amateur chef. From the 48” Viking stove to the simplest button on the microwave, state-of-the-art appliances, elegant cabinets and every culinary convenience are available to create the finest gourmet feast or a quick midnight snack. The ground floor is all about activities and entertainment. The spacious recreation room features a traditional paneled wet bar, multiple seating areas, a flat panel plasma television and a classic Wurlitzer jukebox that evokes memories of days gone by. 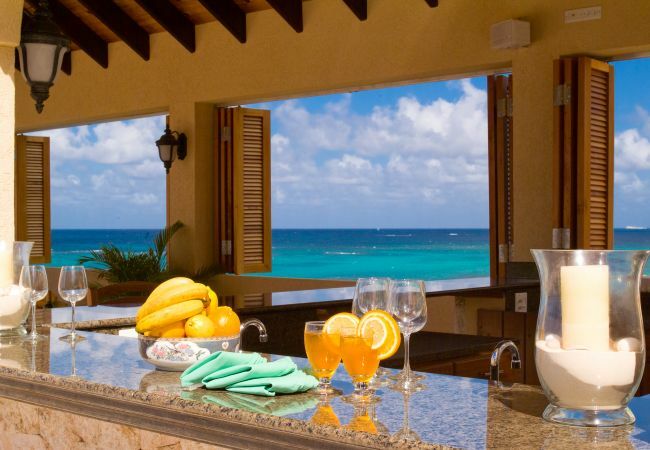 The office allows for catching up with emails, pending projects or online entertainment with your own or a villa computer and high speed Internet connection. Adjacent to the recreation room and across from the office is a fully equipped fitness room with a variety of cardiovascular and resistance training equipment and cable television. The first of Ultimacy Villa’s two self-contained suites is located on the ground floor. This suite is tastefully decorated and offers a king-size bed, large en suite bath, adjoining living room, full kitchen and dining area. The crown jewel of Ultimacy Villa is the property’s lavish pavilion located on the pool level. Offering more than 5,000 square feet of well-appointed outdoor living, this oasis includes a large swimming pool and deck area, a whirlpool Jacuzzi, daybeds and umbrellas, a covered gazebo featuring lounge furnishings for your complete comfort, a full wet bar and outdoor dining throughout the pool area. 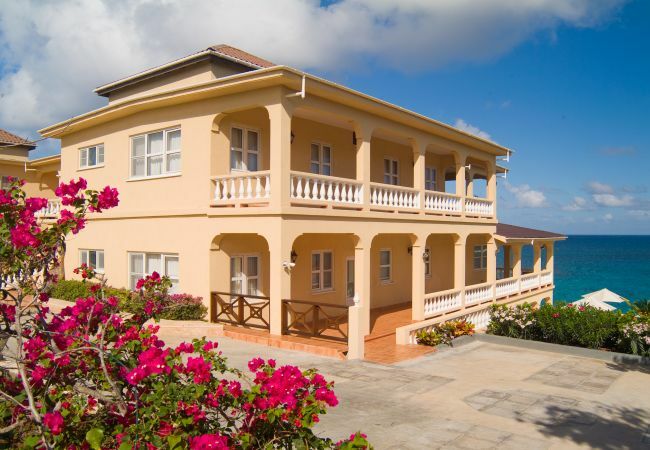 The villa’s second self-contained suite is located across from the pavilion. 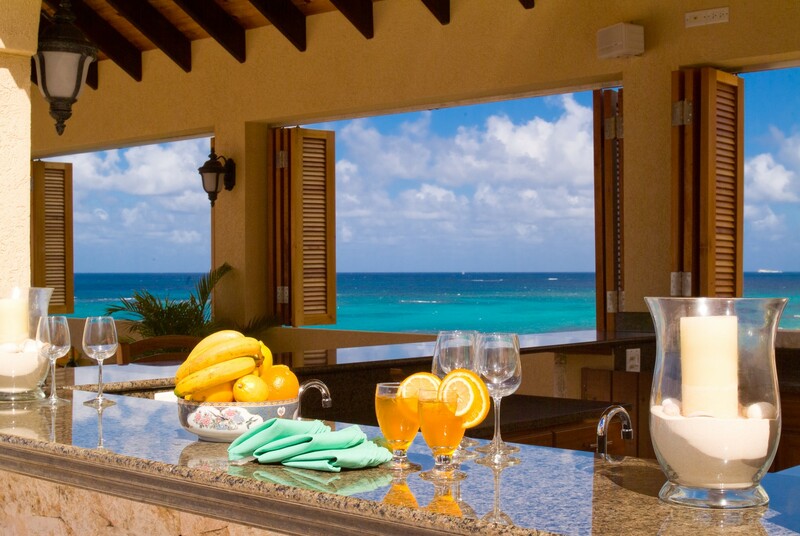 Decorated in bright and sunny colours, the Pool Suite features a main living area with expansive ocean views, a fully equipped galley kitchen, dining area, and a bedroom with a queen-sized bed and en suite bath. A second bedroom with twin beds is also accessible through a connecting door, allowing the suite to be converted into a two bedroom apartment. Another single bedroom with ocean views, queen bed and private bath, is located on the western end of the pool level and is accessible only from the covered terrace – allowing for complete privacy apart from the other living areas, as well. 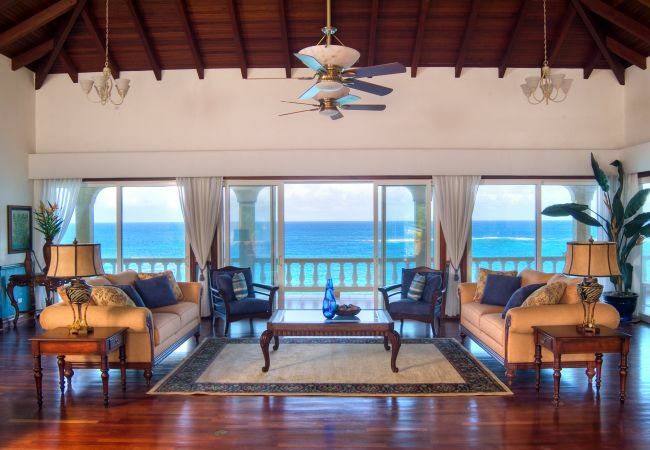 This room enjoys stunning views of the Caribbean sunsets throughout the year. - 10 Bathrooms with shower. - TV, garden furniture, terrace, barbecue, private swimming pool.